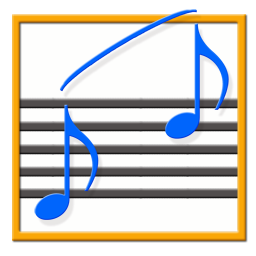 Convert and Replace v2.4 will convert the files of the selected tracks using an iTunes encoder chosen on-the-fly (each encoder’s current Preferences-set options will be in effect) and replace the original tracks throughout the playlists of your entire library with the newly converted versions. 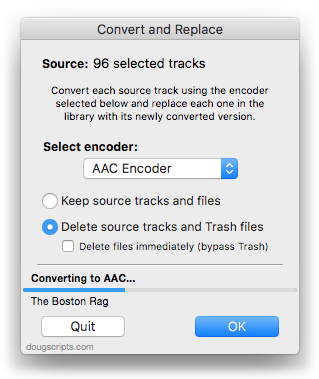 Additionally, you can opt to Trash/delete or keep the original files and tracks. This latest version will stay running and not quit after conversion (registered version), monitors changes to the selection of tracks and removes the ability to select a playlist of tracks. Interestingly, a Correspondent inquired if the script could be modified to accommodate two conversions. Here’s why: he wanted to convert 24 bit depth/48 kHz audio files (downloaded from Bandcamp) to Apple Lossless. But Apple Lossless conversion retains the original bit depth and sample rate, defeating the purpose (to some extent) of converting to a smaller file format. So he uses the script to convert these files to 16 bit/44.1 kHz AIFF files first and then again to convert them to ALAC. Performing two conversions back-to-back automatically with different encoders would be a bit of a stretch for the script. So, as a compromise, I have let it stay open after conversion (at least for registered users) so that the original set of tracks remains the Source if a second conversion of them is required. A registration code for Convert and Replace is $1.99 and it’s free to demo for ten days; it’s a free upgrade for current users. It can be downloaded from this page.